Starting March 2018, many new lines of the Delhi Metro network will begin operating. With the completion of Delhi Metro Rail Corporation’s Phase III expansion, the Indian capital’s metro rail system would become the fourth largest in the world with over 350 km of corridors. Its current network spans 231 km following the recent opening of the Botanical Garden-Kalkaji Mandir section of the Magenta Line. 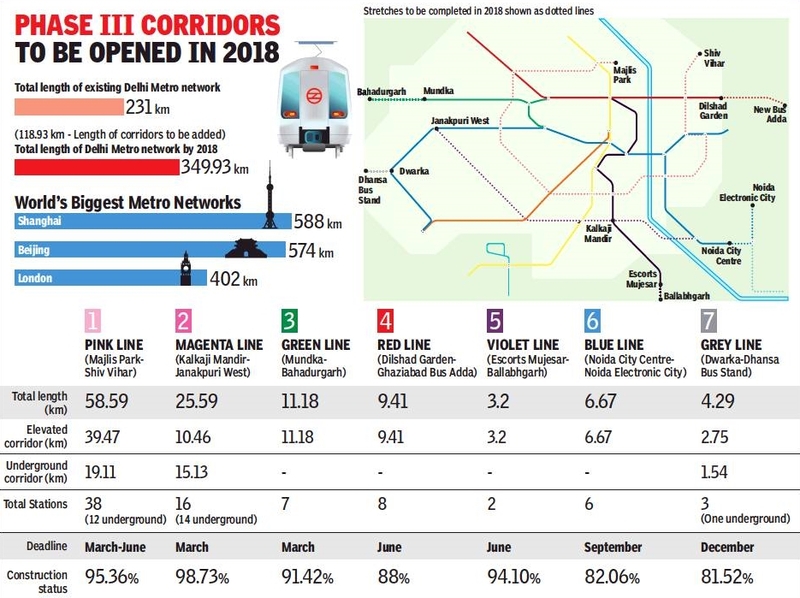 Anuj Dayal, executive director (corporate communications), DMRC, said Delhi Metro has 173 operational stations at the moment, making it the ninth largest metro system in the world. “After the completion of Phase III, we shall have a network of over 375 km, including the Noida-Greater Noida corridor and would be the largest after Shanghai, Beijing and London,” Dayal said. The Noida-Greater Noida corridor would be a part of the Delhi Metro network with an interchange at the upcoming Noida Sector 52 station. Though constructed by DMRC, this corridor would be operated by the Noida Metro Rail Corporation. It is expected that the next Delhi Metro corridor to be opened will be the Kalkaji Mandir-Janakpuri West corridor of the Magenta Line, the first section of which was inaugurated by Prime Minister Narendra Modi on December 25. The corridor has already brought Noida closer to south Delhi, but when the line is extended to Janakpuri West, the distance between Noida and Gurgaon would also shrink with the availability of interchange at Hauz Khas station with the Yellow Line (HUDA City Centre-Samaypur Badli). DMRC promises to complete the section by March 2018, though its opening for commercial operations would depend on the safety go ahead from the Commissioner of Metro Rail Safety. The Kalkaji Mandir-Janakpuri West corridor would also bring the domestic Terminal 1 of the Indira Gandhi International Airport on the metro map. At present, IGIA is connected with the city centre through the high-speed Airport Express Line, but the corridor doesn’t have direct connectivity with Terminal 1 handling domestic flights. March 2018 will also see the completion of the massive Pink Line (Majlis Park-Shiv Vihar) with a length of 58.59 km. 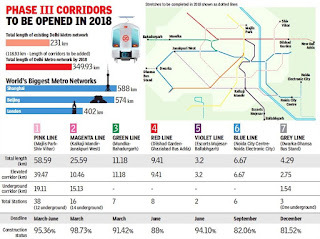 The Pink Line will act as a ‘Ring Corridor’ connecting most parts of Delhi. A small stretch of the corridor, between Mayur Vihar Pocket 1 and Trilokpuri, however, will not be a part of the line due to land-related issues and will, therefore, remain a missing link. The Pink Line will turn the Delhi Metro network into an intricate web by bringing the existing corridors at 10 different interchange points, including with the Airport Express Line at Dhaula Kuan station. In 2018, DMRC will also make its third foray into Haryana after Gurgaon and Faridabad by extending the Green Line to Bahadurgarh. DMRC will also extend the Violet Line from Escorts Mujesar in Faridabad to Ballabhgarh next year. The extension of Blue Line from Noida City Centre to Noida Electronic City will not only bring Delhi Metro closer to many sectors of Noida, but also to areas in Ghaziabad such as Indirapuram.